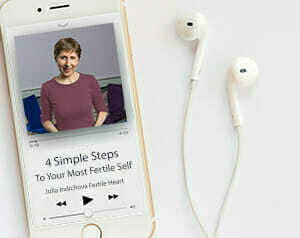 In this brief segment of the Health Show, New York Times columnist Robert Lipsyte interviews Julia Indichova and Dr. Frederick Licciardi about infertility issues and the lifestyle changes and healing regimen that helped Julia overcome her hopeless infertility diagnosis and give birth to her daughter at the age of 44. Since the broadcast of that show, Julia has guided countless other women with elevated FSH and other fertility challenges to reclaim their health and their fertility through the life-enhancing tools of the Fertile Heart Ovum Fertility Program. It’s been a 5 year journey. Today I can say I am glad I stood my ground and I followed what felt right to me. I am a very different person, and I will be a much better mom. This has been a life lesson for me, and a huge part of it, I learned through the Fertile Heart Ovum practice.